Almost everything that could go wrong has gone wrong with my learning. I just have to take it with a grain of salt. Finally, Gracie Rose and Raine Eden got a better set of eyebrows. 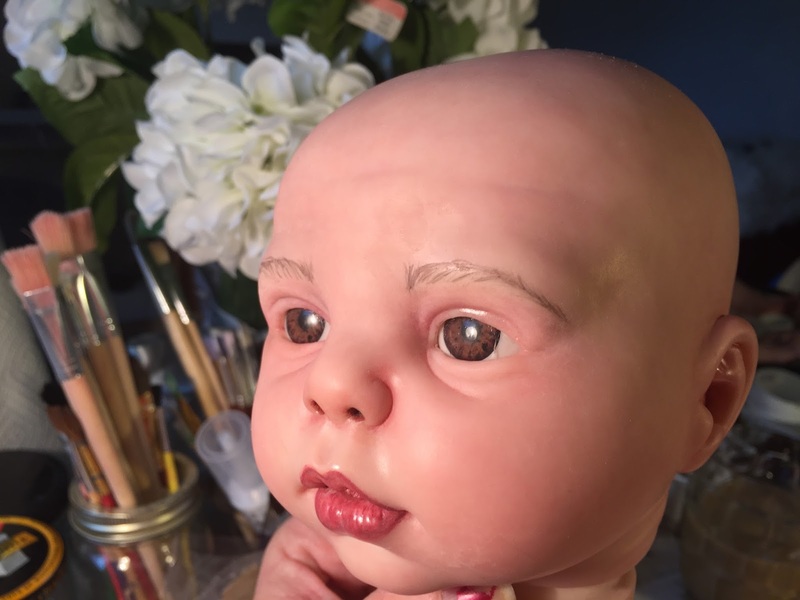 I removed the eyebrows and repainted them until I was finally happy with them. What a pain but I was delighted to thin the eyebrows out and paint the tiniest of strokes, but I realize I do need to go even thinner most of the time. 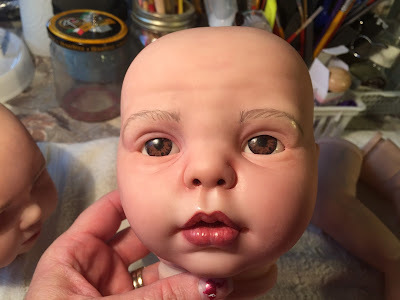 I had to be careful because removing the eyebrows, though I did not remove all layers of paint, it did make the vinyl a bit shiny. So afterward I had to take care to apply a couple layers of Genesis heat set matte varnish mixed with baby skin and a touch of blushing rebaked in my NuWave oven. I cut one of my paint brushes down to where there is only a small amount of bristles. I might cut it down even more but at least I got a desirable effect as it was. I found that thinning my genesis heat set paints down and using Eyebrow Brown with Vein Blue. I think I mixed about 3 Eyebrow Brown / 1 paintbrush dabs of Vein Blue paint into a small amount of paint thinner and it did not take much to get a tiny amount of what appeared to be black. I later used more of my brownish hair color with a touch of blue to give the eyebrows a more brown appearance. I had painted them before without the blue and though the paint was brown, the eyebrows on Celeste came out yellowish. Putting the blue in was an important part of making the eyebrows look less yellowy. I painted a wisp of a very fine line from the middle of the brow to the end of the eye. Then I proceeded to make v shaped arrows towards the end of the eye leaving only a tiny line at the end. Then I made lines from the bottom up to the top of the brow in the side of the brow that was the thickest and I curved the ends of the line towards the bottom of the brow. I also put in a few of the tiniest wispy lines at the front end of the brow to make it look as if a few got away, giving it a natural wispy look. It was not easy and I removed them again and again until I got them right. After like 20 times I finally started to get them right. I noted the angle is important or else they do not look right. So I made the mistake of putting Gracie Rose's eyelashes on too early. Now I almost feel it should be the last thing I do. 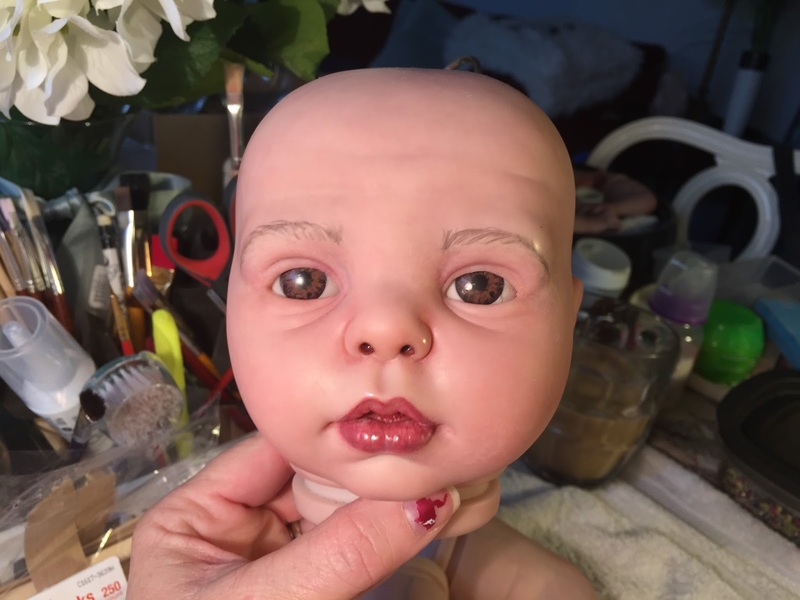 While redoing her eyebrows with my heat gun (small heat gun) because I did not want to mess up her eyes or eyelashes in the oven, I made the mistake of melting her eyelashes down to nothing. I ended up having to pull the remainder off and clean the eyeballs off. I may have either cracked her eye slightly or got an eyelash stuck in it. You almost can't see it. I will list the doll as is since it's my first release. I can't replace the eyes at this point as they are glued in. They still look pretty darn good and I am going to put crystal clear resin in them as I planned originally. She will be ready for auction after that. I will notify the new owner that she has a slight defect in the eye and a tiny defect on her doeskin body which I found on the body after it arrived. I was kind of upset about it. Raine Eden with new eyebrows. Painted them differently this time and they look good. Raine Eden was painted with Baby Skin x2 dabs and Brow Brown x 1 dab mixed in to the Baby Skin. It gave her a slight olive look. 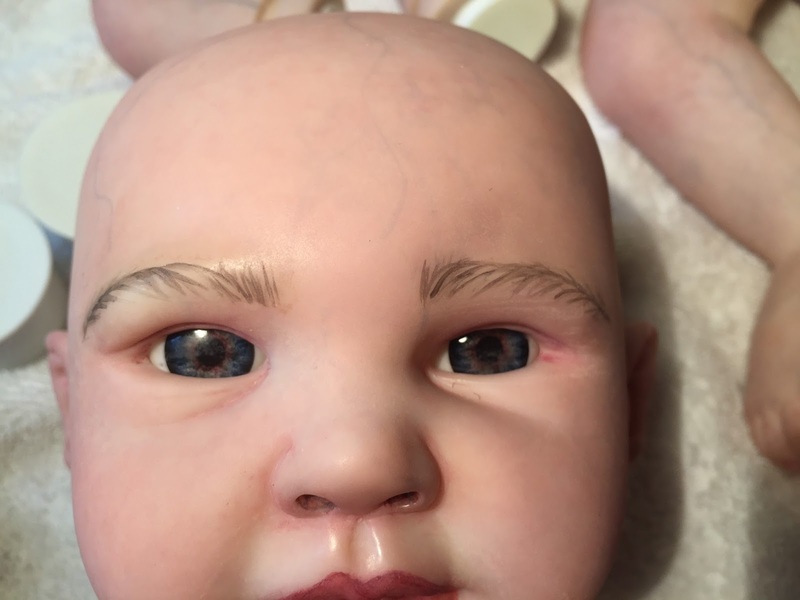 It was worth a try to change the color of the original baby skin a bit. I put in her Pabeo eyes, the blue ones. They are so cute! Gracie Rose with new eyebrows shown below. I don't know if you can see the problem in her eye. But it is barely noticeable. At this point I pulled her eyelashes back off and cleaned the eyes out. I also toned down the lips using the Baby Skin color from Genesis Heat Set Paints. One other problem I had is when putting on the head, the strings did not hold the head on so I had to go find a kit that had the zip tie parts and borrow one zip tie for the head. Glossy Eyes Are So Cute! 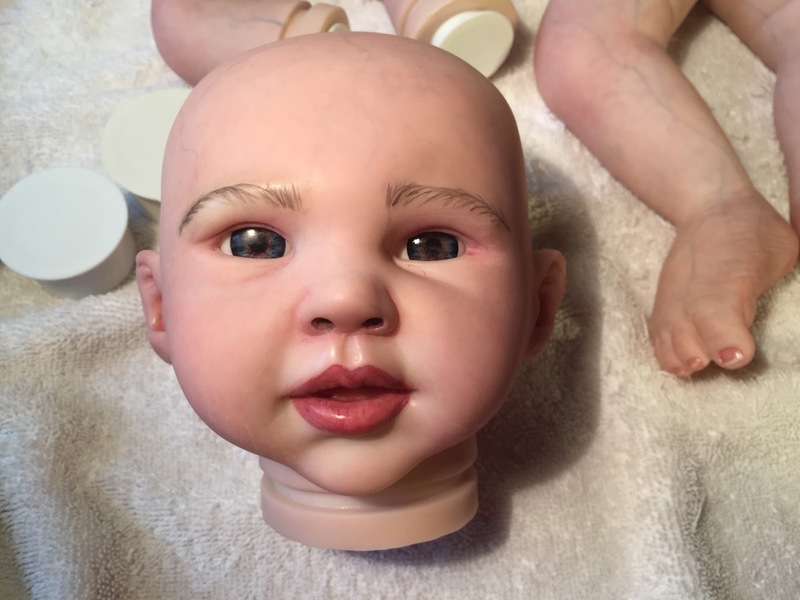 Love The Lifelike Look! Scroll down after clicking to see!